Stitchers Anon: A quickie and a find! A quickie and a find! Just a quickie pepes..please keep voting on the butterflies..they are all so completely gorgeous aren't they, and I have had two more sent to me late and to be fair I will let them have a prize but not put them through the pressure of joining a competition late. Both ladies enjoyed stitching them so that's what counts right? Right! I have been busy organising threads, cleaning, cooking etc ...so much for a week off but never mind! On a bright note it means my bedroom is tidy, the drawers which seem to attract clutter have been sorted out and my craft room is ready and waiting for me to get in there and do some work! And...I found the cable for my camera. A while ago I designed a wedding sampler for neighbours. Elaine stitched it for me because I am rubbish if I have to work under pressure. I freeze. Well, I got it back and framed it and took a piccie or two before wrapping it. Only durrrrrr...guess who forgot to put the memory card in the camera? Yup..and then I couldn't find the lead to get the piccies off the camera. Well, all the tidying meant I have found the lead! Yay!!! So here is the final finished piccie. The letters are stitched in burgandy because that was the colour of the bridesmaids dresses and the flowers were roses, which matched the bride's bouquet. Thank you Elaine for stitching it for me. The married couple loved it and because we were invited to the wedding I was happy to report to Elaine that we had the flowers perfectly, colour, tone and shape: and the burgandy was right too...Yay, we rock! I have one more thing to show you. 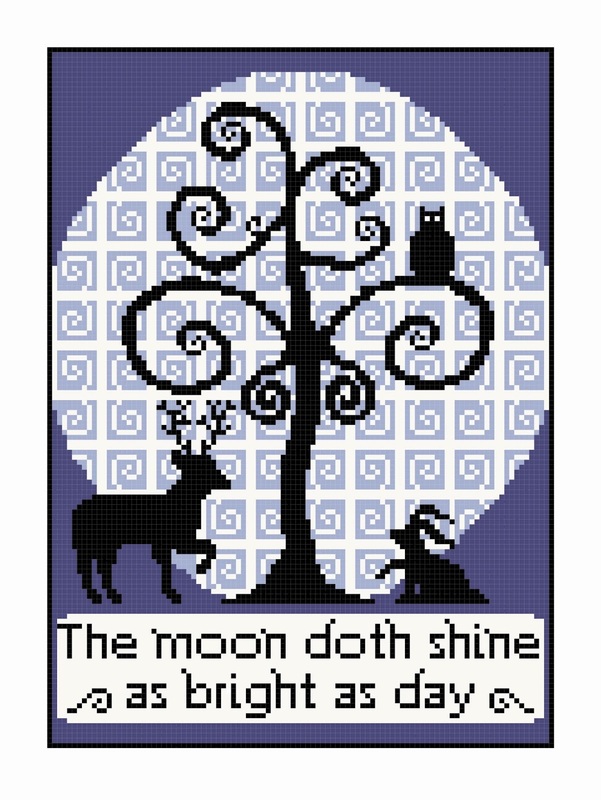 I was asked to alter the colourway of The Moon Doth Shine for a lady who wanted to stitch it for her son's bedroom. Her son is autistic and loves anything with animals in it. He is apparently a big fan of Farthing Wood. He is not however a big fan of pink, understandably! So here it is revised. I really like these whimsical charts..they are so much fun to do! Right, I am going to have a nice hot shower, a cup of tea and go to bed with my crafty books and work out what I am going to do tomorrow..there is nothing left to clean! Have a great week everyone! Thanks for popping by and thanks even more for saying hi! I love the sampler and so glad everything matched the wedding. Your Colours for Moon are perfect. The wedding sampler will be cherished so much, such a lovely treasure for the happy couple. Nothing left to clean?? Are you kidding me?? Come on over... I will feed you, house you, etc, if you will do that to MY home!! Ha!